Are you working in a tight development spiral? 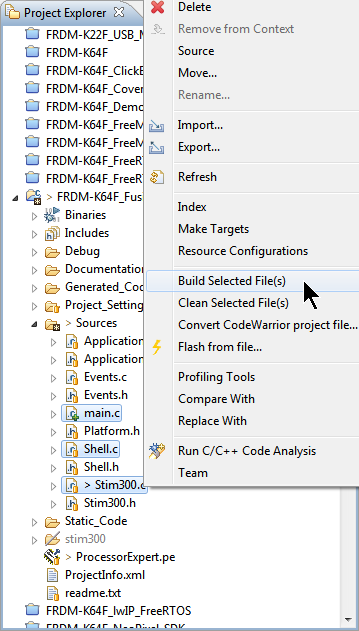 You make changes to files that propagate to a massive project build. But you just need to verify that the files you're working on will build. Here's an easy way to do that. arm-none-eabi-gcc -mcpu=cortex-m4 -mthumb -mfloat-abi=hard -mfpu=fpv4-sp-d16 -O0 -fmessage-length=0 -fsigned-char -ffunction-sections -fdata-sections -Wall -g3 "-I..\\Generated_Code" -I../Sources -I../Project_Settings/Startup_Code "-IC:\\nxp\\KDS_3.2.0\\eclipse\\ProcessorExpert/lib/Kinetis/iofiles" "-IC:\\nxp\\KDS_3.2.0\\eclipse\\ProcessorExpert/lib/Kinetis/pdd/inc" "-IC:/Users/Erich Styger/Data/HSLU/Vorlesung/nemesis/CCE/Eck/KDS/FRDM_K64F_Fusion/Sources" "-IC:/Users/Erich Styger/Data/HSLU/Vorlesung/nemesis/CCE/Eck/KDS/FRDM_K64F_Fusion/Generated_Code" "-IC:\\nxp\\KDS_3.2.0\\eclipse\\ProcessorExpert/Repositories/Kinetis_Repository/lib/Kinetis/pdd2/MK64FN1M0LL12/system" -std=gnu11 -c -o "Sources\\Application.o" "..\\Sources\\Application.c"
arm-none-eabi-gcc -mcpu=cortex-m4 -mthumb -mfloat-abi=hard -mfpu=fpv4-sp-d16 -O0 -fmessage-length=0 -fsigned-char -ffunction-sections -fdata-sections -Wall -g3 "-I..\\Generated_Code" -I../Sources -I../Project_Settings/Startup_Code "-IC:\\nxp\\KDS_3.2.0\\eclipse\\ProcessorExpert/lib/Kinetis/iofiles" "-IC:\\nxp\\KDS_3.2.0\\eclipse\\ProcessorExpert/lib/Kinetis/pdd/inc" "-IC:/Users/Erich Styger/Data/HSLU/Vorlesung/nemesis/CCE/Eck/KDS/FRDM_K64F_Fusion/Sources" "-IC:/Users/Erich Styger/Data/HSLU/Vorlesung/nemesis/CCE/Eck/KDS/FRDM_K64F_Fusion/Generated_Code" "-IC:\\nxp\\KDS_3.2.0\\eclipse\\ProcessorExpert/Repositories/Kinetis_Repository/lib/Kinetis/pdd2/MK64FN1M0LL12/system" -std=gnu11 -c -o "Sources\\main.o" "..\\Sources\\main.c"
arm-none-eabi-gcc -mcpu=cortex-m4 -mthumb -mfloat-abi=hard -mfpu=fpv4-sp-d16 -O0 -fmessage-length=0 -fsigned-char -ffunction-sections -fdata-sections -Wall -g3 "-I..\\Generated_Code" -I../Sources -I../Project_Settings/Startup_Code "-IC:\\nxp\\KDS_3.2.0\\eclipse\\ProcessorExpert/lib/Kinetis/iofiles" "-IC:\\nxp\\KDS_3.2.0\\eclipse\\ProcessorExpert/lib/Kinetis/pdd/inc" "-IC:/Users/Erich Styger/Data/HSLU/Vorlesung/nemesis/CCE/Eck/KDS/FRDM_K64F_Fusion/Sources" "-IC:/Users/Erich Styger/Data/HSLU/Vorlesung/nemesis/CCE/Eck/KDS/FRDM_K64F_Fusion/Generated_Code" "-IC:\\nxp\\KDS_3.2.0\\eclipse\\ProcessorExpert/Repositories/Kinetis_Repository/lib/Kinetis/pdd2/MK64FN1M0LL12/system" -std=gnu11 -c -o "Sources\\Shell.o" "..\\Sources\\Shell.c"
In the screenshots I’m using NXP Kinetis Design Studio v3.2.0 which is Eclipse Luna based, but things should apply to any other Eclipse distribution. 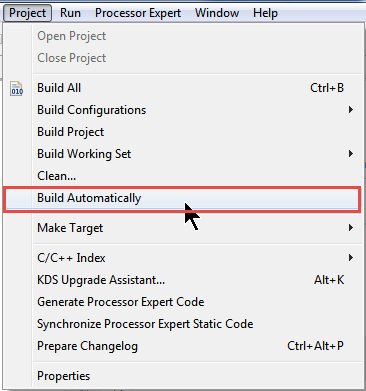 Verify that ‘Build automatically’ is disabled, both in the Project menu and in the workspace preferences. 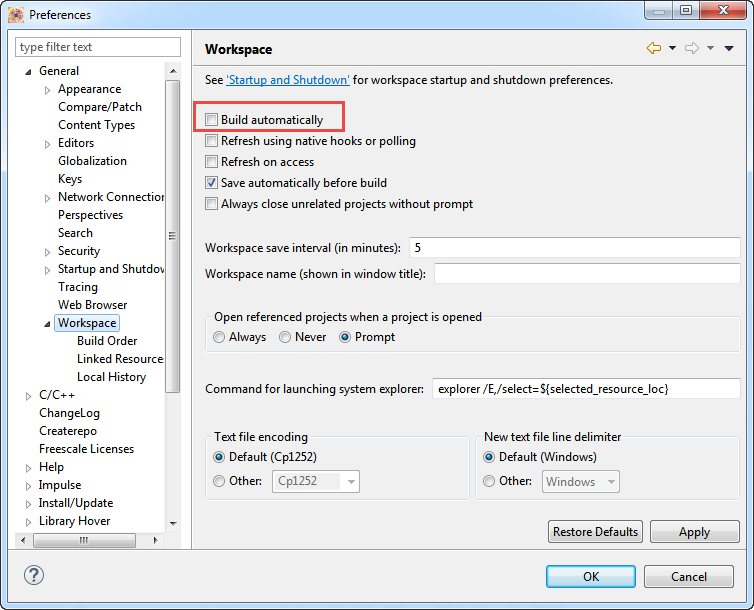 Change the setting to make sure it gets written to the settings, then restart Eclipse. Try with a new workspace, first with a ‘new’ project, then import your existing project into that new workspace and try it out. If this works, then it is probably a setting in your old/existing workspace. If somehow only works with the new workspace, you probably should go with the new workspace and import your existing project into it. I had this issue with a workspace I carried through different Eclipse versions. Make sure you select only files you can build, e.g. not a *.h file. Building or cleaning only a few files which I select is a nice feature. It only works if ‘build automatically’ is disabled.